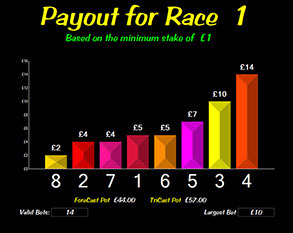 Race night ticket sales are based on either 50p or £1 units. 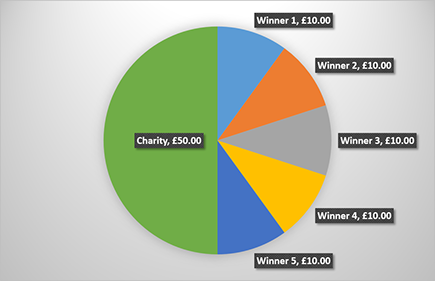 The total amount of money taken on each race is split 50/50 between the fundraisers and the winners. The race card has 64 horses which can be sold at £2 each, raising £128.00, the winning horse owner from each race receives a prize or cash. 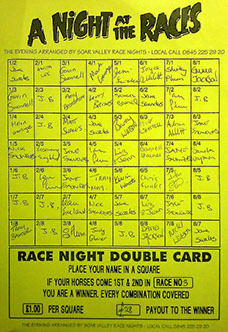 Another way of fundraising would be to sell the individual squares for £1 on the forecast sheet. 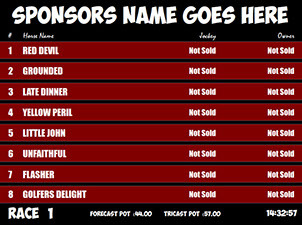 Total Taken would be £56, the winner receives £28. This would also be beneficial to the people who could not attend the event but would like to have a go! These can also be sold prior to the event giving the advantage of selling more than one sheet.